Our trip to Café Luna started long before stepping into the restaurant. 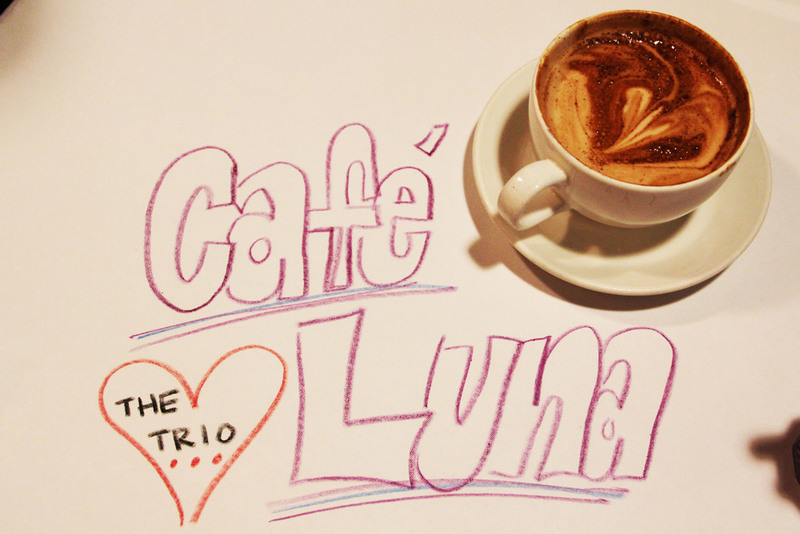 Whenever The Trio discussed Sunday brunch options (which was very often), Marisa would eagerly suggest Café Luna. After hearing the same suggestion every single time, Jordan and Amanda finally gave in and e-mailed the restaurant to get a reservation. We e-mailed on Monday for a Sunday reservation and to our surprise, the reply informed us that the next available time was actually two weeks away. Hearing this only increased our curiosity, and we eagerly claimed the last time slot remaining for Sunday, November 23rd (which happened to be Jordan’s 20th birthday). Something was telling us we were in for a treat. That morning, we made our way from Danielsen Hall (see, living there has its perks) into Cambridge by way of the Mass. Ave Bridge. It wasn’t long before we came across a tiny café with a huge mass of people gathered outside. We made our way into the café and found that it was even smaller than it seemed; there was a small group of tables in the front, a row of tables along one wall, and a counter on the other. We confirmed our reservation with Matt, the delightful owner who kindly greeted us by saying he had been “expecting us.” While our table was being prepared, another group walked in and we overheard Matt tell them that there was a wait of over two hours for a party of any size. Once again, our interests were piqued and we could barely contain our excitement. We were led to a teeny tiny table in the very back of the café and instantly dug into the menus. 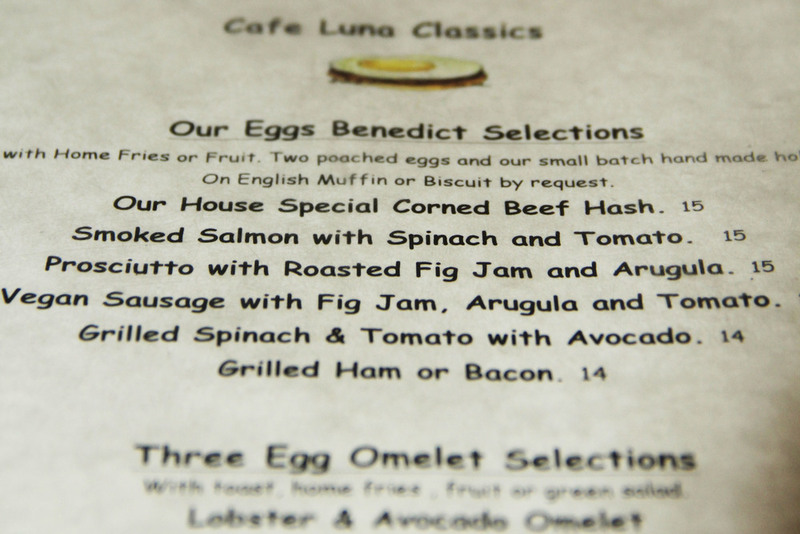 The possibilities were endless- most notable seemed the selections of waffles, French toast, and eggs benedict. As Amanda struggled to figure out how to work the Canon EOS 40D camera that she borrowed from her roommate, the birthday girl ordered herself a Dirty Pumpkin Chai. The rest of us got our bearings and placed our brunch orders. Jordan attempted to order the Fresh Berry French Toast, but our waiter stopped her and promised that the Fresh Berry Waffles were much more “wow.” For Marisa, it was as if Café Luna had entered her dreams and designed an omelet just for her: butternut squash, goat cheese, avocado, and caramelized onions. Amanda ordered something very “stereotypically Amanda:” Nutella Stuffed Waffles with fresh strawberries on top. While waiting for our food, we channeled our inner four-year-olds and made use of the crayons on our table by coloring on the paper table liner. It was only fitting that we started our crayon adventures by writing out “Café Luna” and “The Trio.” We then proceeded to play several games of hangman. We were having so much fun that we barely even noticed when a server approached our table, two heaping plates of waffles in hand. Marisa’s omelet followed soon after. Being the respectable journalists and Instagrammers (@bitchinbrunch) that we are, we held off on devouring our food and instead focused on capturing the beauty that was our brunch. After sending one of her pictures to her sister back home, Amanda took her first bite. Immediately afterwards, she sent a one-worded text as a caption- “unreal.” The Nutella was spread generously between two waffles and had begun to melt from the heat of the sandwich. The masterpiece was topped off with fresh strawberries, homemade whipped cream, and powdered sugar. It was heaven on a plate. Jordan’s waffles were equally as exquisite. Instead of Nutella, her waffles were covered with what she believed to be fresh berry butter. The waffles were stacked two high and topped with a mountain of berries. Each mouthful was even more delicious than the last, as the sugar in the batter had caramelized in the waffle iron to create the perfect bite. Marisa was immediately captivated by her omelet. All of her favorite ingredients were combined in a way she had never experienced before. The sweetness of the butternut squash and the smoothness of the goat cheese complemented each other perfectly– not to mention the avocado and caramelized onions that made the dish all the more savory. She dubbed it the best omelet she’s ever had. Marisa may have been the last to receive her meal, but she was certainly the first to devour it. We walked out the door in mutual agreement that this had been one of our best brunches to date. Café Luna had completely captured our stomachs and our hearts.